Rendering of Cherry at W Washington DC hotel. 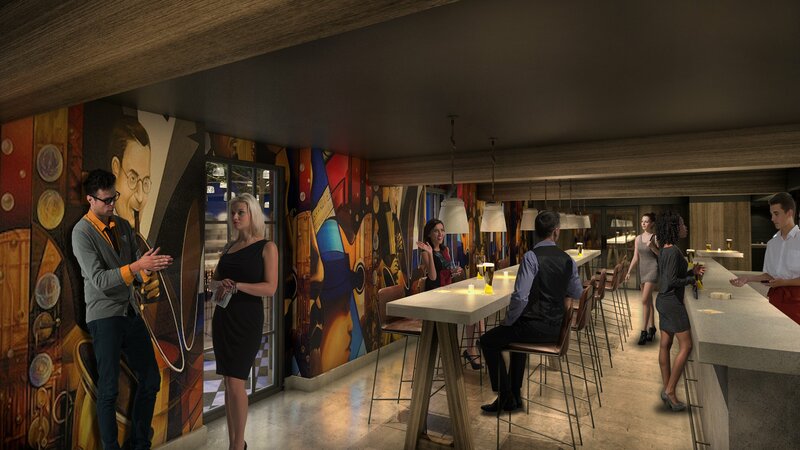 The W Washington DC hotel is undergoing a complete culinary makeover. Later this spring, it will debut two new drinking and dining options: Cherry, a grill-centric restaurant revolving around a custom 15-foot hearth, and Corner Office, a bar focused on wood-fired pizzas and craft beer. “We’re not cooking with gas. It’s back to basic elements,” says chef Will Morris, who previously ran the kitchen at Vermillion. The name Cherry nods to the official fruit of DC (yes, it’s cherry) and the famous myth about George Washington cutting down a cherry tree. (The hotel is trying to make a connection between its “honest food” and Washington’s “I can’t tell a lie” line.) But Cherry also refers to the cherry wood that will fuel the hearth along with hickory and oak. The local, seasonal menu is still in the works, but expect a wide range of meats, seafood, and vegetables to get the fire and smoke treatment. Among the highlights: a whole (or half) chicken brined overnight with heavy aromatics and slow-roasted over the embers. The bird will be served with charred scallion and sesame butter. Morris also plans to start a dry-aged program and offer a rotating butcher’s cut of beef. For groups of at least six that give advance notice, Morris also wants to offer some platters such as a lamb shoulder, whole beef rib, or entire suckling pig with caramelized apple compote. Seafood options will include a wood-fired crab cake and skillet of shrimp with butter and herbs. Morris notes that he’s just as excited to show off vegetables too. Avocado will be charred in the embers, giving it a peel-like black skin, then served with a charred avocado sauce as well as a tomato salad, trout roe, and herbs. A 15-foot hearth and two wood-fired ovens will be open to the dining room of Cherry. Rendering courtesy W Washington DC. The dining room itself has been totally reconfigured since its days as Mediterranean restaurant Pinea, which closed in November. The 60-seat space is no longer walled off from the lobby, so you can see the flames from the open kitchen when you walk into the hotel. 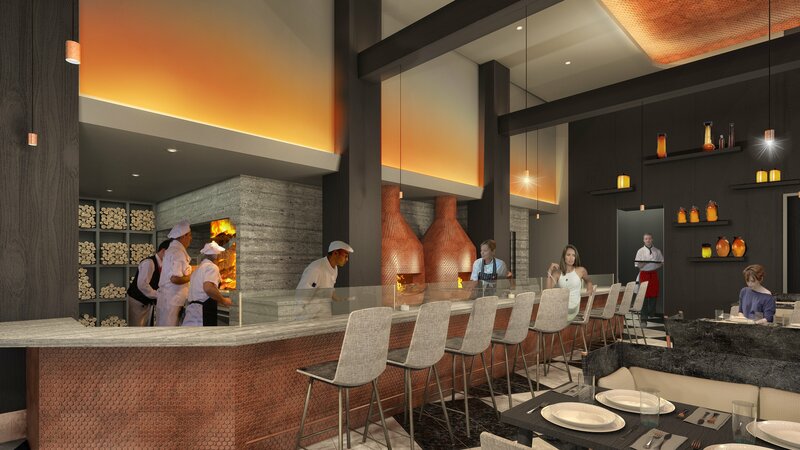 Diners will be able to sit along a counter that faces the hearth and two wood-fired ovens. The restaurant’s bar area has also been expanded to 110 seats. All 24 draft beers, rail spirits, bitters, and shrubs will be sourced from within 50 miles of DC. Amsterdam-based cocktail consultant Jarl de Vries of Cocktail Professor, who’s worked on a number of W Hotel menus around the world, is creating the cocktail list. Corner Office will serve wood-fired pizzas and 38 beers on tap. Rendering courtesy W Washington DC. At downstairs Corner Office (accessible at 15th and Pennsylvania), Morris will offer a menu of wood-fired pizzas—but don’t label them any particular style. The 12-inch pies are designed with a thin crust (soft dough but crisp bottom), and Morris says he’s working with a cheesemonger to come up with a nice blend. The menu will also include some simple appetizers and salads. To pair with the pizza, the bar will serve 38 beers on tap plus draft wines and cocktails. The offerings will span from a good German doppelbock to a West Coast IPA. 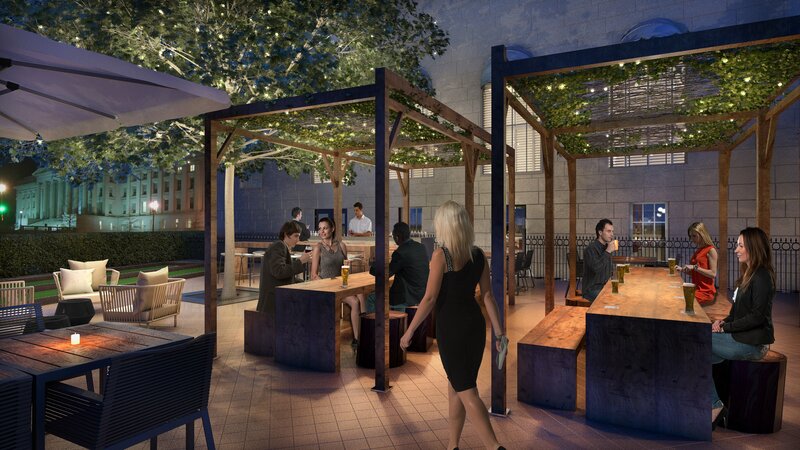 The outdoor patio will be transformed into a beer garden with bocce in the summer, curling in the winter, and a retractable awning to keep the drinks coming year round. Corner Office’s year-round beer garden. Rendering courtesyW Washington DC. Cherry and Corner Office. 515 15th St., NW.